A week after returning from Atlantic City, Jamie Mooney held up his end of the father-son bet. He placed a phone call to an auto parts company and ordered a new package for his son Brandon’s truck. Before long, Brandon Mooney’s 2004 Ford F-150 will be outfitted with a leveling kit, new rims, and new tires. It was what he asked for when he sat down with his dad and went over his goals for the 2018-19 wrestling season: place in the top five at states, upgrade your truck. Mooney pulled off the feat in dramatic fashion. 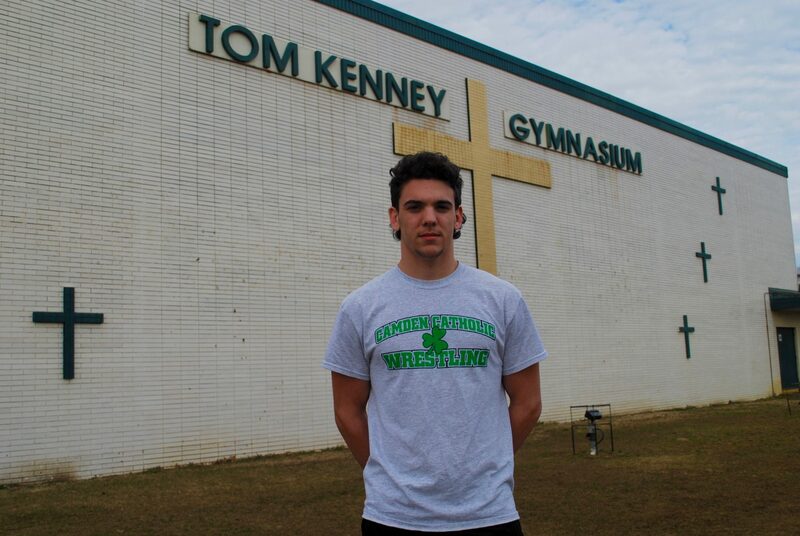 The Camden Catholic High School junior and Deptford Township resident knocked off the top-seeded 152-pound wrestler at the state tournament at Boardwalk Hall – twice, on consecutive days no less – to place fifth in the tournament. Even with his truck’s upgrades riding on his final match of the season, Mooney didn’t try to stress or think about it at the time. Mooney didn’t win a state title – he can make a run at that as a senior next year – and he was the odd state placewinner who also didn’t finish first at Districts or Regions, either. But just as he knocked off the state’s top seed in Atlantic City, Delsea’s Nick Bennett, he also enacted revenge on Howell High School’s Paul Jakub, who beat him in the District 25 and Region 7 tournaments in the previous two weekends. Mooney, who finished higher than any other South Jersey resident at the state tournament, earned more than a new package for his pickup truck. He is also The Sun Newspapers Wrestler of the Year. “Until sophomore year,” he said. Mooney first advanced to the state tournament as a sophomore last season and began to realize his potential. He took a significant step in his high school career as a junior. Mooney reeled off a 14-match winning streak while rolling through South Jersey competition (he went undefeated this season in matches against traditional South Jersey schools). His four, in-state losses came to Jakub (whom he ended up beating in the pre-quarterfinal round at states) and Pope John’s Robert Garcia (the eventual state champion). Finally knocking off Jakub, after losses in each of the two previous weeks, was the momentum shift that catapulted Mooney toward the fifth spot on the podium, even if it was at least a little unnerving when he saw the brackets before the tournament. “I have him and the one-seed next? I was a little nervous,” Mooney said with a laugh. Still, he was confident he was prepared, both mentally and physically. In the very next match, Mooney beat the top-seeded Bennett in sudden victory. But how did he overcome Jakub, whom he couldn’t solve in the two previous Saturdays? Mooney pinned Jakub a minute into the second period. He hit up Chickie’s and Pete’s for a celebratory meal that night and got in some Fornite before heading to bed and waking up to knock off the tournament’s top seed before falling to the state champ. Mooney, who said he’d like to come back and coach when his career is through, has one more season to try to move to the top spot of the podium in Atlantic City.